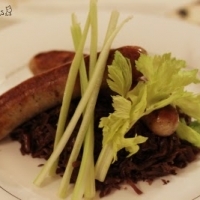 Always keep some sausages and sauerkraut in your fridge just in case you want fast and simple meal after a hard's work. You can get the meal ready within 20 mins. Heat up the olive oil in a pan. Add sauerkraut and mix well with the oil. Add caraway seeds and stir fry till you can smell the fragrant of the caraway seeds. At the same time, on another pan, with just a little olive oil fry the sausages till brown all around. oh, i am a sauerkraut gal and crock it fresh all the time! Great combo! Like quaypocooks's recipes? Never miss an upload!